We are highly instrumental in offering the most sought after range of Scrubber Systems offered in premier quality and as per the diverse requirements of various industries. These systems are light in weight, easy-to-install and compact unit, specifically designed for effective and economical pollution control from low volume sources. These are made of best raw materials like M.S & S.S. that provides them a great strength and durability. With the constant support of our expert team, we are engaged in offering the clients with a huge assortment of Industrial Scrubber that specially designed & manufactured to control the losses occurred during the burning activity of the wastage like polish, sweep, floor sweep, & the waste waters like hand wash & ultrasonic. 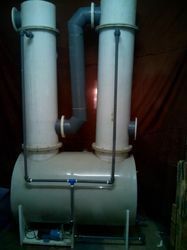 These scrubbers are made of the high graded raw material with the help of sophisticated machines and latest technology. Looking for Scrubber Systems ?